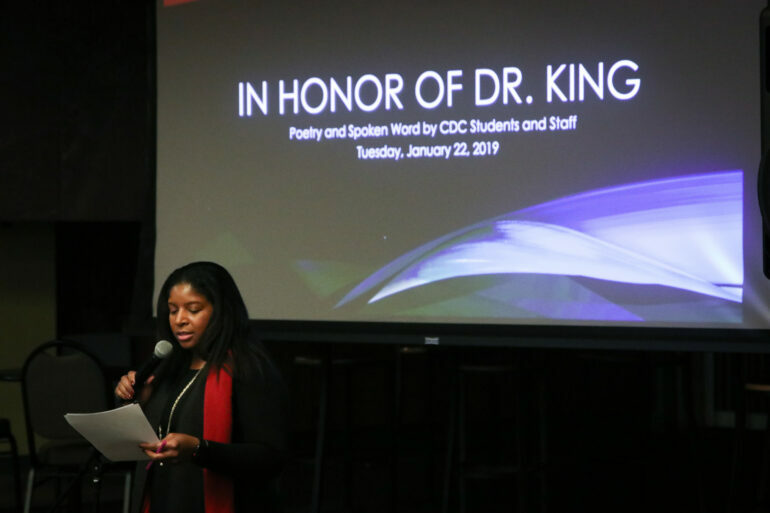 Martin Luther King Jr. Day was nationally celebrated on Monday and USD students were given the opportunity to understand the significance behind the holiday at the Martin Luther King Jr. Spoken Word event on Tuesday night. This event kicked off the Center for Diversity and Community’s (CDC) weeklong celebration of Martin Luther King Jr. The event was designed to celebrate the written words of famous Civil Rights activists, as well as allow students to share their personal narratives. Laura Chandler, director of the CDC, hosted the event. Eight students and staff members of the CDC read the works of Martin Luther King Jr., Alice Walker, Margaret Walker, Ella Baker and more. “She (Alice Walker) broadened the women’s movement to include women of color and appreciate their traditional, cultural and creative roles,” Chandler said. Teagan McNary is a senior majoring in political science and criminal justice. She said the purpose of this event was to educate people and allow them a space to remember the teachings in the words of Martin Luther King Jr.
McNary read a work written by activist Margaret Walker because of its powerful message. “I think it speaks to a lot of people, especially at that time,” she said. Senior biology major Santini Lokonobei read an original piece she had written two years ago for Black History Month. “The theme for that year was fine arts, so I wanted to touch on poetry,” Lokonobei said. The piece was written from Lokonobei’s perspective during her youth. Lokonobei grew up in Sioux Falls, S.D., but spent most of her childhood in Nashville, Tenn.
Transitioning from a mostly black neighborhood to a primarily white neighborhood, Lokonobei grappled with her self-identity. “There are some things I would see on T.V. and in society that would make me question, am I beautiful?” she said. The poem titled “Playing in the Dirt” was Lokonobei’s opinion on her mom’s perspective about the expectations of women. She said being surrounded by her friends in the audience made it easier for her to share her poem. The Center for Community and Diversity will host events all week to celebrate Martin Luther King Jr.